MANILA, Philippines (AP) — Close allies of Philippine President Rodrigo Duterte have resigned from his Cabinet to run in elections next year that will test his popularity and could determine his future political influence. 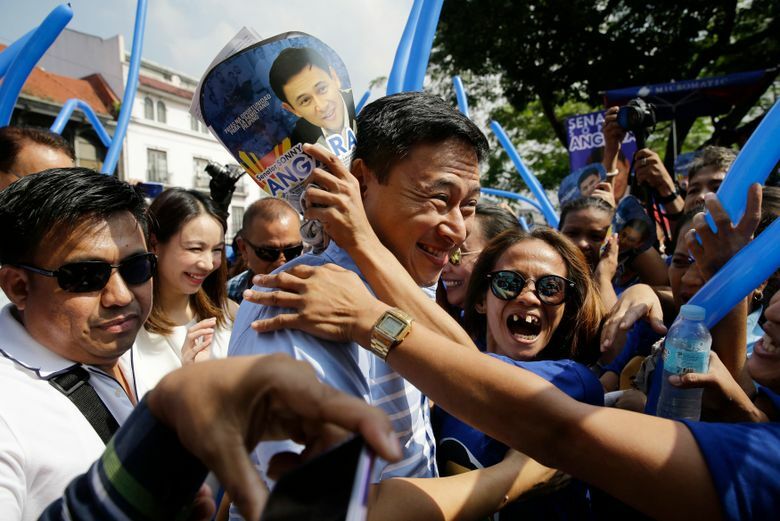 Among those running in the May 13 elections are Duterte’s former foreign secretary, who staunchly defended him from international criticism of his deadly anti-drug crackdown, his spokesman, his political adviser and a longtime aide. Wednesday was the final day for aspirants to register as candidates. More than 18,000 government posts are up for grabs, including 12 seats in the 24-member Senate, which stymied efforts by Duterte allies this year to rapidly open the country’s constitution to amendments and allow a shift to a federal system of government. All the seats in the larger House of Representatives are to be contested. Duterte, 73, has remained generally popular since he won a six-year term in June 2016 on a promise to eradicate crime and long-entrenched corruption, despite international and domestic criticism of his bloody crackdown on illegal drugs, which has left nearly 5,000 suspects dead in clashes with law enforcers. 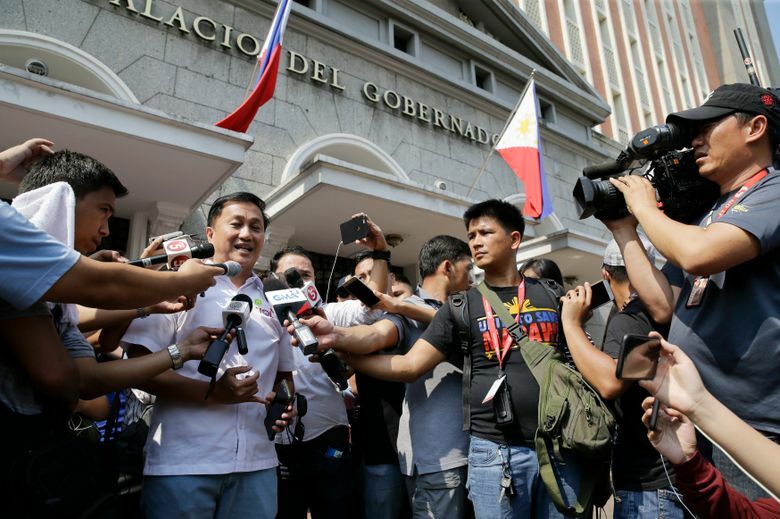 “If you think the president is doing his job, vote for us,” said Duterte’s long-time aide, Christopher “Bong” Go, who is seeking a Senate seat along with two other Cabinet members. Duterte accompanied Go as he registered for his first political contest. While Duterte’s allies overwhelmingly dominate the House, the Senate has posed a challenge with the presence of vocal opposition members as well as Duterte allies who have taken critical positions on touchy issues such as changing the 1987 constitution. Jean Franco, a University of the Philippines political science professor, said it’s crucial for Duterte’s candidates to win more seats in the Senate although many of his candidates face an uphill battle partly due to their lack of political experience. “If you can’t control the Senate after the midterm elections in terms of numbers, federalism may really be out and of course the other crucial issues,” Franco said. 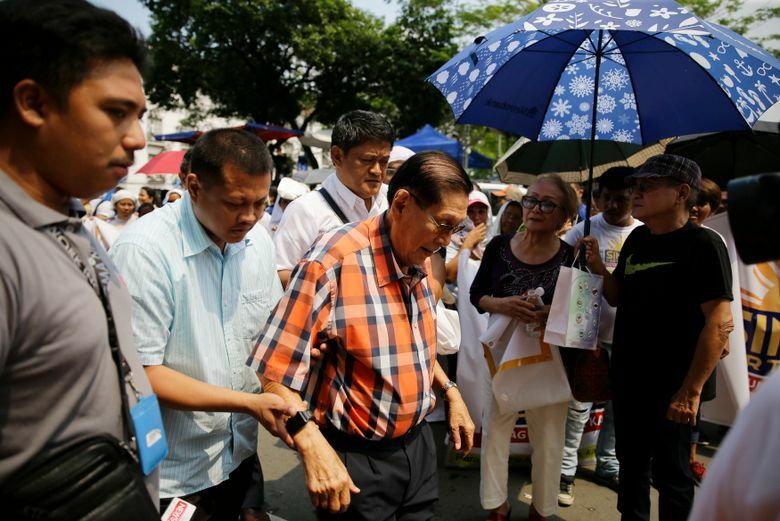 Congress’ repeated failure to pass a law to enforce a constitutional ban on political dynasties allowed prominent political names to again grab the spotlight ahead of next year’s polls. Imee Marcos, a provincial governor and the daughter of the late President Ferdinand Marcos, filed her candidacy for the Senate, while the offspring of other politicians who fought the Marcos dictatorship in the 1970s and 1980s are also seeking Senate seats. Ferdinand Marcos’ 89-year-old widow and outgoing House member, Imelda Marcos, is planning to replace her daughter Imee as governor of northern Ilocos Norte province. An army-backed “people power” revolt ousted Marcos in 1986. He and his wife were accused of plundering government coffers during years of rule that were also marked by massive human rights violations. The Marcoses, who backed Duterte’s presidency, have denied any wrongdoing. “I think the new generation, particularly the millennial generation, are ready to hear our side of the story,” Imee Marcos told reporters. Jose Manuel Diokno, dean of a law school and son of a nationalist politician jailed by Marcos in the 1970s, said he would help strengthen the country’s judiciary if he wins a Senate seat. Followers of Diokno and Marcos heckled each other when the two registered for the elections Tuesday. “We don’t have accountability because we don’t have a working justice system. We have lots of corruption and there are many syndicates and organized crime because of our weak justice system,” Diokno said. Duterte’s daughter, Sara, is running for re-election as mayor of southern Davao city while two of his sons are seeking to become Davao vice mayor and a House representative.